Hi Guys, it's Brock Johnson here! Today I'm talking with Casey Gauss, the CEO of Viral Launch. He's an eight-figure entrepreneur. He knows what he's talking about, and he's a great ethical guy. Viral Launch has done over 30,000 product launches. This is the largest data set out there of Amazon specific sellers so he sees what works and what doesn't work. He’s not an Amazon seller. I interviewed him and asked him basically everything I wanted to know, getting down into the numbers, like what works, what doesn't. Brock: We’re going to talk about the common failures that we see specifically in product research. How do you know, you see something and it's doing a lot of numbers, but is it a good idea or not? Casey will talk about common things that he sees, because he's seen 30,000 launches or so now. Casey: Yes, 30,000 launches, thousands and thousands of sellers. Some have gone on to build nine-figure Amazon businesses. Some have had to close up shop. I am a huge advocate of doing your due diligence in product research to make sure you're making the right decisions. Brock: Would you agree that product research is the most important thing? If you don't do that right you're screwed? Casey: Yes, absolutely. But, if you have a great product, it makes having success so much easier. If you have a bad product, it's a bad product for you, it makes having success impossible. You have to start off on the right foot essentially. Casey: This can be chopped up to two different ways, but basically people will look at one ASIN and assume that it is representative of the market as a whole. But in reality it's not at all. You should definitely be looking at market averages or a good portion of the performance of the listings. On page 1, let's say there are 24 listings. You should be looking at how the Top 15 or whatever are performing because that is most indicative of what you can expect. What this looks like as an example is let's say, you want to sell a ‘fish oil’ and there's a guy in position #5, he has 20 reviews, but he's selling 5,000 units a month. So, what we see people do is they'll say, "Wow, all I need to do is sell that exact ASIN!". Let's say they have 120 capsules at this strength or whatever, they will source that exact product essentially. Let's say it is ‘grill brushes’ and that one happens to be ‘green’. They will source a ‘green grill brush’ because their stats look good. They think it's a function of the market or the market choosing a ‘green grill brush’. What you can't take into account is maybe they're amazing at running outside traffic. Maybe it's Brock Johnson on the other side, just killing it with AdWords and Facebook ads or something like that. You have no idea what's driving that success. To make a bet on this one particular ASIN is fatal sometimes. The other side is looking at the market. We've seen markets where maybe the only the top two listings are performing really well. Let's say 'grill mat' or let's take 'shoes'. Let's say you can private label shoes and you're thinking about getting into shoes. The number one ASIN, let's say they're selling $500,000 a month and it's Nike. Then the number two, ASIN is a Reebok shoe and they're selling $300,000 a month. But after that, everybody is only selling $5,000 a month. A seller will think that they'll be able to take a portion of that $500,000. So, they'll get into this market. I think it's really important to know. Is this a brand that has some kind of following or is that traffic coming from Amazon, which is going to be the traffic that you will be taking? Casey: People don't pay attention to how they're going to achieve success. They will see, let's say Internet routers. I have a good example of these guys, smart guys. They come to me and they have internet routers. 1. We're IT guys. We know a decent amount about this market. 2. A lot of people are getting on the Internet. A lot of people are buying these routers. What they didn't pay attention to is how they're going to achieve success, how they're going to go and get those sales and how they'll gain attention in the market. Page 1 on Amazon, all name brands, Asus, Linksys, Netgear, big brands; they all have tons of reviews, a thousand plus on average. You have to compete against name brands in a very competitive space with lots of reviews. To have success, even if it was possible, they would have had to spend hundreds of thousands of dollars to do that. They were only prepared to spend $5,000-$10,000. I see too many sellers just paying attention to how much money they can make. They're not paying attention to 'how am I going to put myself in a position to make that money?’ Generally, it's a cost thing. Brock: You got to pay attention about how much it costs to get to that first page. You couldn't make it without being on that front page, but you're just going to be doing PPC. It’s going to take you months. It can work, but you're not going to get to that first page without the costs. You can still make it organically, but you've got to have something better. Casey: (Agreeing) Yes, distinctly better and you have to get it in front of people. It's definitely a process. Brock: I've actually got on the top page for my clips stuff with that which was selling thousands a day. I got there organically with no launch, no nothing. But, it was just because mine was so unique and better and it wasn't a brand play. But, you couldn't do that in routers, you'd get destroyed. Casey: Me-too is where we see so many sellers that all source the same products. We’ve been seeing the same products continue to be popular in terms of the decisions people are making for literally years, like three years now. We've been seeing so many Garcinia Cambogia, Turmeric Curcumins and grill brushes and grill gloves. I think it's so tempting to say like, maybe you know a friend of a friend that made $100,000 selling grill gloves or whatever. And so you're like, "Well, if they sold $100,000, if I can only make like a portion of that, I would be happy." And so you're like, "Well, I'll charge a little bit less." You have no idea how much they're going to charge. We see so many people make those decisions and it just doesn't work out for them. Some of them ended up closing up shop or stop selling that product. They just write it off and move onto a better product. We see so many people saying, "I can probably do that too. I know they made money on it. I can probably do that too." Brock: Is that just because they'll see money in the market and then they just think, "Okay, if I just copied that exact way". Do you think that is why they fail? Is it because there's no differentiation? It's just a copy of that and the other guy's already ranking. Why do you think those people fail? Casey: It's partially that, but it's partially in a lot of these me-too markets. It's so competitive that you need an insane amount of money in order to compete well or you're going to go to the sponsored ads route. But, sponsored ads in these really competitive markets are expensive and you have no reviews. It’s so difficult to get started in these highly competitive markets. It seems a lot of the Me-Too markets are these super competitive markets. Brock: I know there's a lot of Chinese sellers these days getting fake reviews. Do you have to do crazy launches and giveaways to get into those (competitive markets)? Casey: Yes. We have some clients where in their first 90 days, they're giving away a minimum of 9,000 units of their products, sometimes a lot more. These are highly competitive markets where maybe they're selling 20,000 units a month organically after ranking. These markets are so competitive. All of your competitors are running giveaways. They’re low on price. They’re spending a ton of money on sponsored ads. They have amazing photos. They have amazing listings. Like everybody's going all out. To compete, you have to go all out. That's why we push the low barrier to entry to new markets because you don't have these people spending hundreds of thousands of dollars going negative hundreds of thousands of dollars. They'd been in there for years getting thousands of reviews. You have none of that. You just get to go in. Maybe the highest review quantity for a listing is $100 or something really low. It's so easy to get in and have success. Brock: This kind of leads into that where what you were just saying this and not having enough money to spend on ads. Let's say someone has $5,000, you'll get people coming to you who have spent pretty much all $5,000 of that on the product. And then say, make it happen. Casey: Yes, exactly. And it's like, "Okay, sure, maybe you have an uncle or something that's really talented in product photography so you can get that done. Maybe you can scrounge together a listing, but it will be hard with no keyword research tool. But after that, just having a listing on Amazon doesn't mean you're going to sell it. You need to run some kind of ads that cost money. You need to be doing something to drive traffic. 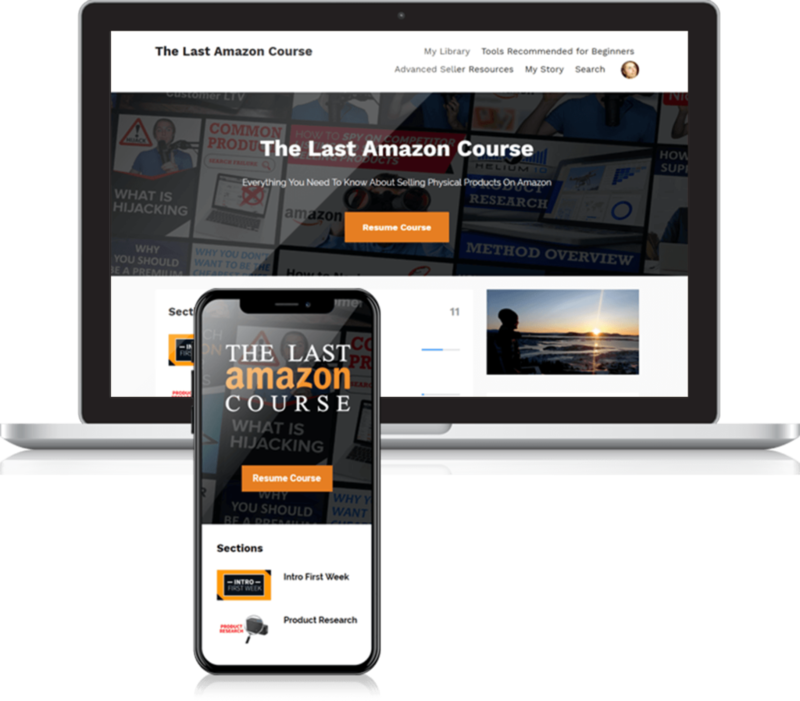 You have to have money in order to have success on Amazon. You can't spend all your money on your inventory because there are some marketing dollars that are required essentially. Brock: That's what a lot of people do not take into account, unless you've got something crazy new. I had my eclipse glasses that were relatively similar to others, but mine were better. I had to run crazy ads too. But then, because my glasses were so unique, I actually had no ads, and just an iPhone picture and it worked. It made it on a tough front page. But that was only because it was so unique. From my experience, Amazon will reward something that is really loved, but it's got to be really loved. Me-too markets are not going to be really loved products. Casey: We see a lot of inventions come to play but what you need to realize is people need to find your product. People have to be searching for those search terms. If you invent something that nobody has ever thought of, no one is searching for it on Amazon. Let’s take 'fish oil diffuser'. There's no such thing as a ‘diffuser for fish oil'. That’d be kind of nasty. No one is searching ‘fish oil diffuser’. You would have to rank for these high volume keywords like 'essential oil diffuser'. But, people who are searching 'essential oil diffuser' don't want a fish oil diffuser. So, they're not going to buy it. If no one is searching the main terms for your product, no one is looking for it. No one's going to buy it. But for Brock's example, people were searching for ‘solar eclipse glasses’. Brock: They were looking for eclipse glasses, but I read in the reviews that people were complaining that they let in a lot of light. Because there are all these paper ones. So then, I made goggles so that they would fit. It was solving a problem that everybody had. I was literally the only person that solved this problem. It didn't matter that the paper glasses were $2 a piece for everyone else and I was $30 for one pair. It didn’t matter because I'm the only one that solved that problem and it looked cool. So, if you have that right product-to-market fit, then you know it can work. But, I'm only able to invent within what the customer is searching for. I can't just make a great invention that people would love, because if nobody's looking for it, it doesn't sell. But because I was able to get in that search term, people were looking for eclipse glasses. They didn't know they wanted my particular glasses, but when they saw them, they wanted them. Casey: The brilliant thing was you were using Amazon data, which were the reviews, to know that this invention needed to be made. Brock: Yes, because I had no idea until I read all of that. One huge mistake is that sellers don't read their competitor's product reviews. Casey: The last one here, which is included in the me-too... we see so many people sourcing the same products and not all of them are Me-Too products. Sometimes, it's just because there's physical limitations that the products are heavy or products that are large, which scares buyers off. It needs to be the size of a shoe box so it's cheap to ship. It needs to be between $20 and $40 or something like that. Basically, from our experience, I think that you should be selling anything that you can make and sell profitably. Taking into account the shipping fees, Amazon's referral fee, your Cost Of Goods Sold. But, if it's profitable, and you're okay with that profit margin, you should sell it. It doesn't matter if it's a grand piano or it's something the size of a piece of paper that weighs as much. Brock: Selling something that might be dangerous was one thing that put me off at first because I had to get these certifications and do all of this extra work. But I kept pushing through. The more barriers to entry there are, the harder it is but the less competition you'll have once you come out the other side. If it's just something really easy where all you had to do was go to Alibaba, that’s not work. So, there are bigger opportunities where it's harder. Those are some common product failures that stop most people from succeeding at Amazon. Thanks again to CEO Casey Gauss of Viral Launch for connecting with me!